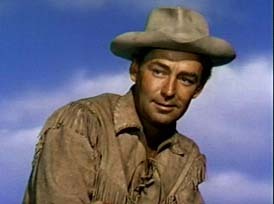 Shane is a 1953 western starring Alan Ladd, a film about a “retired” gunslinger who moseys into a town in need of a hero. The film is a classic western with a story as old as time. Shane shows up in a beautiful Wyoming valley where homesteaders are being run off their land by a bully of a rancher. The bully is even willing to resort to violence to clear the land of the “sodbusters,” but he doesn’t know that Shane is quick on the draw and not afraid of anyone. Of course the film leads up to the ultimate confrontation when Shane has to decide if he’s truly done gunslinging or whether he should use his skills to free the homesteaders from the tyranny of the rancher. As you might guess from the quote above, Shane finds out that a man’s nature isn’t easy to change. And that is the lesson of the film, that and folks need to stand up for themselves against a bully. The western is the perfect genre for this message and I bet this theme can be found in a great many westerns. The old west is where people are independent and can make their own way through hard work and determination. In fact, the western is a truly American genre because America itself stands for this kind of rugged independence. In this story its man against a bully, but you can find similar stories of man versus nature or man versus himself. I love a good western and Shane certainly qualifies. It was nominated for a Best Picture Oscar and several of the stars were nominated for acting including Jack Palance and 11-year-old Brandon De Wilde who plays young Joey who looks up to Shane as a hero. de Wilde is actually a terrible actor in the film, so much so that you want to slap his for his over-the-top portrayal. But this was 1953 and I suppose it was rare back then for a kid to have such a meaningful role in a film. But the kid drove me crazy with his constant questioning of Shane and of course his famous cried for Shane to “come back” at the end. Yes, it’s another one of those movie moments that left an indelible stain on our collective movie-going psyche.